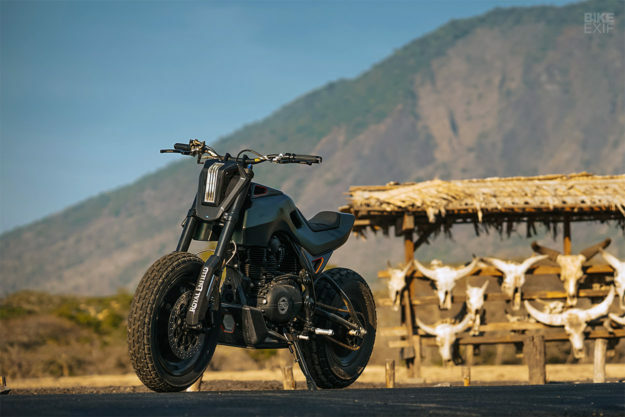 The Royal Enfield Himalayan has been creeping into showrooms around the world by stealth. Originally designed to be a simple, mid-size ADV for the Indian market, it’s now on sale in the USA and Europe. 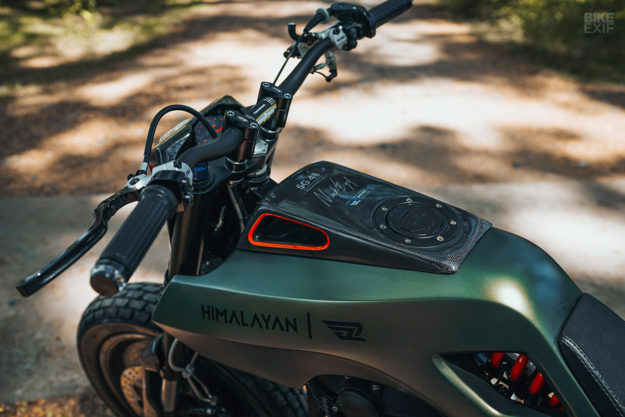 Custom builders love simplicity, which makes the Himalayan a good candidate for stripping down without getting bricked by an electronics glitch. So the UK arm of Royal Enfield called up Bali’s finest, Smoked Garage. 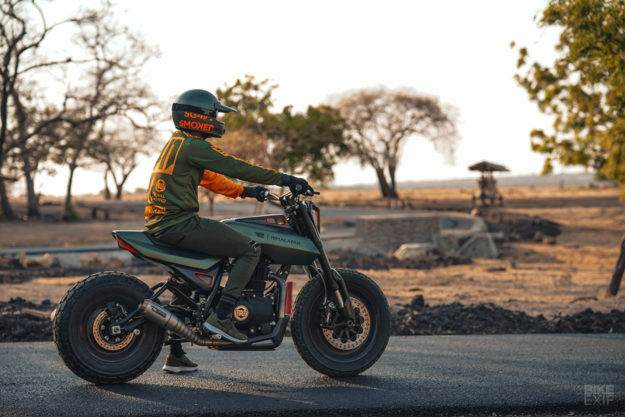 So the Smoked crew decided to draw on Royal Enfield’s military heritage and add a touch of ‘stealth fighter’ influence: sleek and futuristic, but also solid and rugged. 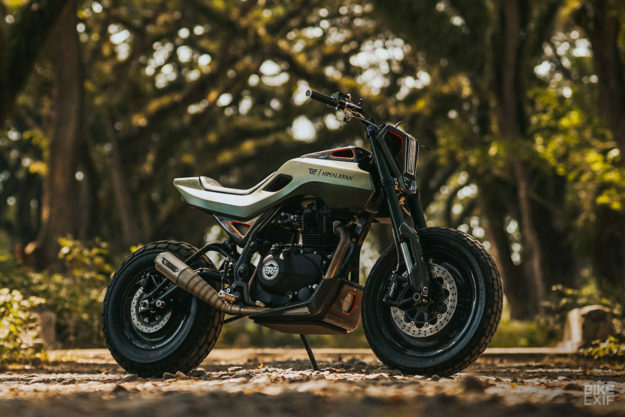 They’ve done it so well, we didn’t clock that this was a Himalayan until we read the build spec. The wheels are off-the-shelf and spoked, although the spokes are now hidden by carbon-coated covers. “We needed large and solid wheels for the modern and aggressive aesthetic,” says Nicko. The front is a relatively conventional 18 x 2.50, but the back is a chunky 14 x 5.00. Both are shod with Dunlop K180 rubber, a road-legal compound with a dirt track tread pattern. Getting the front end and new wheel to fit required custom-machined triples. Further down are custom-made carbon fork guards to protect the tubes and add to the muscular look. 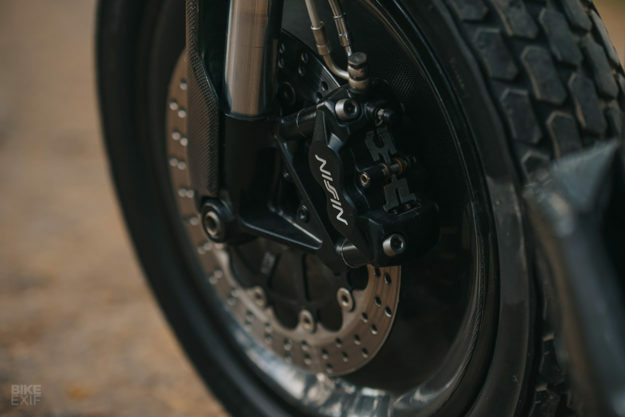 New front brakes increase the stopping power, with Nissin 4-piston calipers clamping onto a pair of 310 mm floating discs. Smoked have a way with bodywork, and the Himalayan’s new clothes are striking. 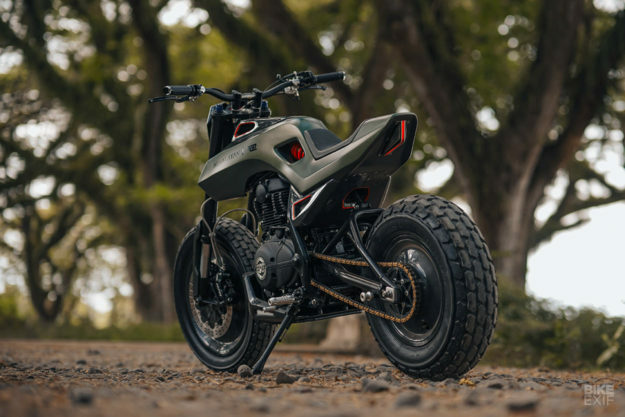 We’re fans of the factory bike’s quirky, upright aesthetics, and the fact that it doesn’t look like a scaled-down motocrosser. But Smoked’s version is something else altogether. The stock stepped subframe is gone, replaced by a low-profile loop. Then Smoked used foam to form the outline of the bodywork, and aluminum for the final shaping. The headlight and taillight are also custom made, to give an even sharper edge. On the factory machine, there’s very little ‘air’ left in the under-seat triangle. 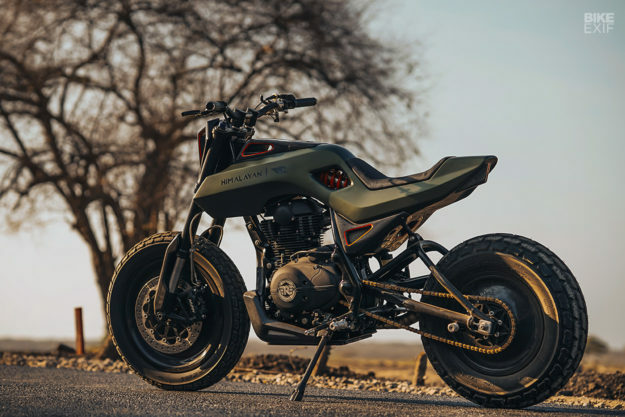 But Smoked’s monocoque-style upper bodywork appears to ‘float’ above the engine, making the Himalayan appear even more compact than usual. “It’s an aesthetic touch to make it that bit extra special,” says Nicko. 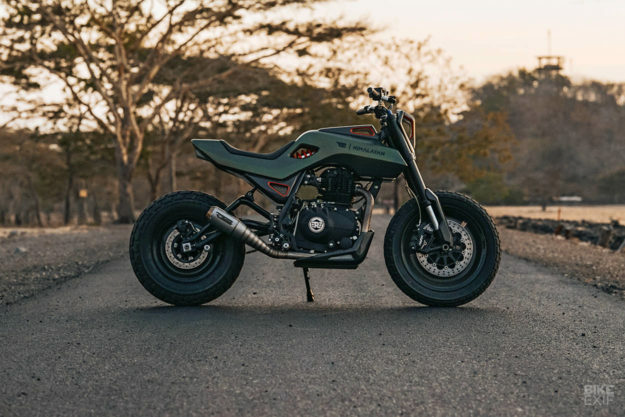 The paint is a dark Army Green, with orange accents to highlight the unusual shapes of the bike. Virtually the only shiny part left is the custom exhaust system, with the headers given a few more curves than the squared-off stock pipework. The ancillaries may be consumer-grade, but they’re top quality. The bars are ProTaper’s oversized Contours, with a low-rise Carmichael bend. Motogadget supplied the Motoscope Pro speedo, control buttons, bar-end indicators and grips; the electrics are all run through the ubiquitous m.unit. There’s a light and airy feel to this build, and it’s reflected on the weighbridge: curb weight is down from 194 to 175 kilos (385 pounds). SG-411 looks like a million dollars. 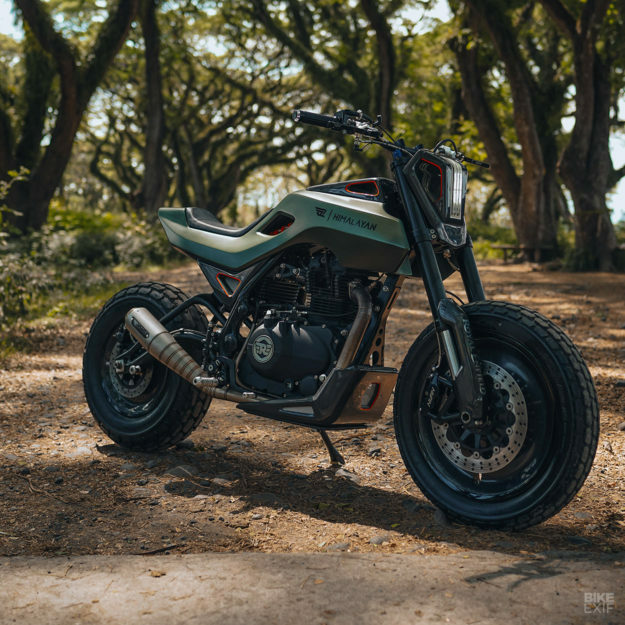 But if you want to build a custom middleweight ADV for yourself, you can do it without breaking the bank: the MSRP of the Himalayan is just $4,499. That leaves a fair bit of cash spare for some creative thinking, doesn’t it?